Are you a fan of CBC’s Dragon’s Den or ABC’s Shark Tank? If so, have you ever wondered how the panellists got there? 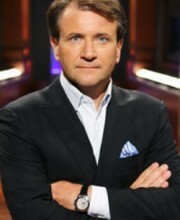 In his semi-autobiographical book, Driven: How to Succeed in Business and in Life, Robert Herjavec tells of his journey from his arrival in Canada as a 7 year old Yugoslavian immigrant in the company of his parents, to the helm of a multi-million dollar, international hi-tech company and a star of the very popular Dragon’s Den and Shark Tank weekly TV shows. Organized into 50 work and life principles that Robert attributes to his success, Driven is a “how to manual” offering nuts and bolts instructions on everything from making a successful pitch on the Dragon’s Den to “10 steps to prepare for opportunity”. The principles are illustrated throughout the book by personal anecdotes about his business experiences and the people he has met along the way. "Selling isn’t always about convincing the other person to hand over money in exchange for a product or service." I’m sure most people “in business” have heard the saying “nothing happens until somebody sells something.” (page 192) Most people would also assume that this statement applies to the salespeople in the organization who head out the door or pick up the telephone everyday to try to sell the company’s products or services. Herjavec believes that “to one degree or another, our sales ability is related to our overall success in life”. Robert believes that, at its core, selling consists of relating to another person and persuading that person to go somewhere he or she perhaps did not plan to go. "Nothing of any consequence was ever achieved without enormous passion and total dedication, not to the goal of making money but to the objective of becoming nothing less than the best." "...the most influential quality of great business leaders has less to do with leading an organization than with inspiring it."